Note that if you have already done a Family Finder test at FTDNA from a DNA sample, there is no need to transfer your results from another company. If you haven't already purchased a Family Finder DNA test from FTDNA, but you have tested at AncestryDNA, MyHeritageDNA, or 23andMe (some versions, not all) you can download a copy of your raw DNA data file from your testing company and upload it to Family Tree DNA. FTDNA doesn't have access to your actual DNA sample, they simply process your DNA data from the other company through their own matching database and list all the people who share some DNA with you. It saves you the cost of a full autosomal DNA Family Finder test, and saves you having to order a kit and wait for your DNA sample to be processed. To transfer your raw data from another testing company, first download your raw data file from your testing company account and save it to your computer, and then go to Family Tree DNA's Autosomal Transfer Program page, enter your name, email address, gender, and click JOIN TODAY! If you already have an FTDNA account, eg. from a previous mtDNA or Y-DNA test, then don't start a new account but click on the red text under the Join Today! button to login to the existing account. If you are uploading data for someone else who doesn't have their own FTDNA account, you do need to start a new account just for their own tests, as each tester at FTDNA must have their own separate account. Then drag and drop your DNA data file into the box, or click on browse file to locate the file on your computer. Click SUBMIT and your file will upload. Once the upload has finished, you will see a confirmation screen displaying your FTDNA kit number. You can now login to your FTDNA account. If this is a new account, you will receive your kit number and password in an email. In your FTDNA account, when you click on Family Finder Matches, you may initially see a PENDING message which means your data hasn't finished processing yet. Check again later. Depending on the number of transfers in the queue, you may need to wait from one hour to 24 hours (my own transfers were ready within an hour). Once the transfer is complete and your matches are visible, you can choose to unlock extra Family Finder features for only US$19, and that process is quick and easy too. To go to the Unlock page, simply click on the myOrigins button or link, and you will be redirected to the page showing what you get if you pay to unlock. What do you get when you unlock? What don't you get when you transfer? For AncestryDNA V1 (to mid-May 2016), 23andMe V3 (Nov 2010 to Oct 2013), and MyHeritageDNA, you receive your full list of matches. For AncestryDNA V2 (from mid-May 2016) or 23andMe V4 (from Nov 2013 to Jul 2017), you receive your immediate, close and distant matches. You do not receive any speculative matches, which in Family Finder are those matches categorised as 4th-Remote Cousin and 5th-Remote Cousin. Many people have commented that they are very surprised that they only received around 200 matches when they transferred their data files from AncestryDNA V2 or 23andMe V4 to FTDNA. Some received more, some a lot less, the variation often depending on the ancestral background of the tester. The reason is that the AncestryDNA V2 and 23andMe V4 tests use chips that examine a different selection of markers compared to their earlier chips (see AncestryDNA announces their new chip). This has made these more recent raw data files less compatible with Family Finder, so that only the closer category matches are reported. You are getting all your closest matches for free, and they are the most important matches, aren't they? You will get all your matches to immediate family, aunts, uncles, 1st cousins, grandparents, half cousins, 2nd cousins, 3rd cousins, etc. The downside is that the speculative category matches that you don't get with a recent transfer may account for a large proportion of your total potential matches! And some of your known and real cousins who share a lower than average amount of DNA with you may be reported in the speculative category. I have known cousins in the speculative category, including 2nd cousins once removed, 3rd cousins and 3rd cousins once or twice removed. And there will be a lot who I haven't identified yet but will in the future, not to mention all the 4th and 5th cousins. Reviewing my own speculative matches from my full Family Finder test (not a transfer) shows that my speculative matches include people who share largest segments as long as 17cM, totals as large as 60cMs (including small segments), and I also have 647 matches in the speculative category that are identified as being Paternal or Maternal matches. To put this into perspective, missing my speculative matches on Family Finder would be similar to slashing my AncestryDNA match list from 169 pages down to less than 2 pages! To estimate the proportion of speculative matches that might be missed in transferred kits, I did a quick count of the total matches and speculative matches from some Family Finder kits that I administer for family and friends (full tests, not transferred kits). Other than the last four kits in the list below, these kits are all for either British testers or Australian testers with predominantly British and Irish origins. The last four kits are from Italian-born testers or Australians with Italian parents. The kits are not all from my own family - there are around 20 different families represented, capturing a broad range of Australian, British, Irish and European ancestries. In the red columns, notice that the number and percentage of speculative matches as a proportion of total matches is huge for people of British and Irish origins. If you or a family member have done a full Family Finder test (from a DNA sample, not a transfer), see what proportion of your total matches are in the speculative category. When the list of speculative matches appears, note the total number of speculative matches displayed at the top right of the resulting list. That will be roughly how many matches you would not see if you had transferred in an AncestryDNA V2 or 23andMe V4 kit. If you have transferred in an AncestryDNA V2 or 23andMe V4 kit recently, open your Family Finder Matches list, look at your total number of matches, then click on the Speculative Relative filter as per the screen snip above, and it should result in an empty list. Then click on Show All Matches in the filter to return to your full list. If you then click on the last page (>>) or reverse sort by Relationship Range, you will see the size and category of your most distant matches. This article is not intended to be negative at all. I love the FTDNA autosomal transfer program and encourage as many people as possible to take advantage of it. I use it myself. It is a great way to find your closest matches in FTDNA's database - the cream of the crop - and for free! I just want to make sure that testers who have transferred their raw data file in from AncestryDNA V2 or 23andMe V4 don't stop there and think that's all there is. 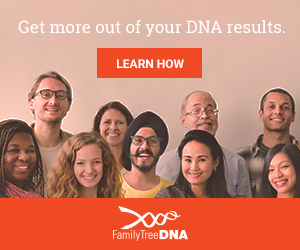 I want them to be aware that there are plenty more matches available to them if they eventually do the full Family Finder test by submitting a DNA sample to FTDNA. If they're stuck with their research and some more matches could help, or they are missing cousins they thought they would match, there are plenty more matches in the database just waiting to be found. Go and get them! Next time there's a sale on Family Finder, consider doing a full test. FTDNA is planning to eventually offer a reduced-priced transfer upgrade for those who have paid the US$19 unlock fee (US$59 was the price announced in an email to project administrators on 17 Feb 2017), but it is not yet available and they do not have an estimated date when it will become available. Another advantage of providing a sample for a Family Finder test, is that your DNA sample will then be stored, allowing you to upgrade to a Y-DNA test (males only) or mitochondrial DNA test in the future, without having to provide another sample. Thank you, Louise, for another (as always) clear and concise summary with a lot of helpful information. That's a good tip about getting a Family Finder test done to have your DNA 'on file' for future upgrades, and it is very reasonably priced.